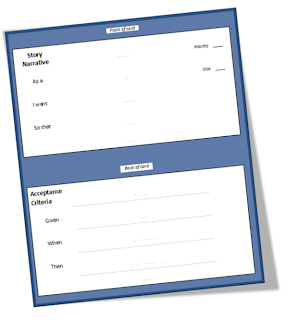 Due to popular demand I have aggregated some information on User Stories and created a simple template. If you feel this would be useful to someone please send them the link. If you have feedback, please leave a comment. This template is provided in three parts. 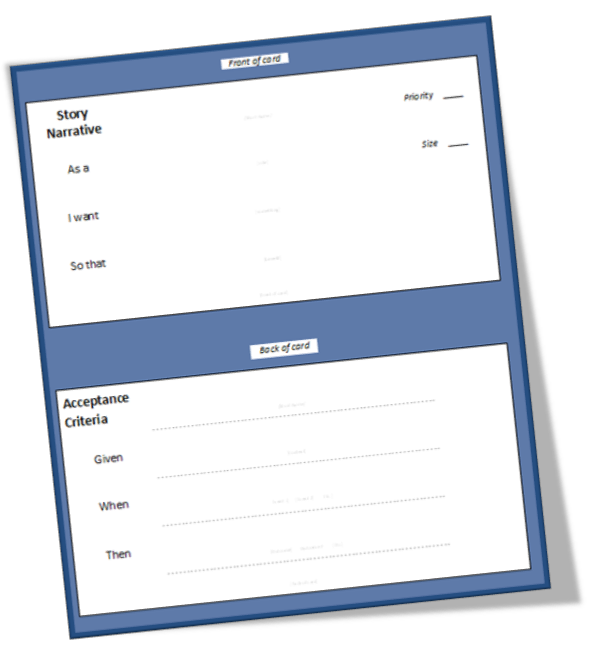 Part 1 is an introduction to the User Story Template and some guidelines. Part 3 is a list of useful references and links that you should read to help maximize your value from this technique. User Stories are supporting artifacts for requirements. User stories are not expected to be a full and complete set of requirements. They are an anchor for a conversation. As a person who is creating and delivering requirements to a development team you may have further details written down, models created and rules listed. These are also useful and should be, like User Stories, used as supporting tools in a conversation with your developers. The value this interaction/outcome is trying to yield. Each of these labels represents a different class of granularity. Epics are huge and suited to things off in the distance. Themes are things generally being worked on now or in the near future. Stories are what you take to the sprint. Smaller classes of requirement fit into the larger ones. Think of Russian dolls. You can read more on these three classes of story elsewhere. You might also want to read something a little more in depth. Try the book "User Stories Applied: For Agile Software Development " by Mike Cohn. Did you find this template useful? Does it need improving? Let me know. As someone new to Agile development and user stories, this was hugely helpful. Thank you. Thanks for the template. Its simple yet covers the required information. I too must say that this post was very helpful!